Ten years ago, Geof Moser had just graduated with a master's degree in solar energy from Arizona State University - but he didn't feel much opportunity lay at his feet in his home country. "The solar industry was fairly small and there weren't a lot of jobs," he remembers. "Just a few for installation." But the Chinese government had big ambitions to expand solar and Moser saw his chance. "You don't want to buy a car door or a car engine, you want to buy a car," he explains. Moser isn't the only US entrepreneur who turned to China. Alex Shoer, of Seeder, helped to launch a business that brings solar panels to the roofs of buildings within the country. He deals with foreign businesses who, say, want to make their Beijing office a little greener. The firm says it has so far erected three megawatts' worth of solar installations, with another 28 megawatts on the way for various clients. "We will source the capital to finance, pay for the whole project and then sell the power at a discount," Shoer says. Again, the model relies on sourcing the right parts at a favourable cost. These kind of installations are known as "distributed generation" projects, in which electricity is produced on a small scale, at or very near to a specific point of consumption. Shoer comments that he was attracted by Beijing's commitment to the solar industry. For years it has encouraged local authorities to do what they can to boost production, research and development. China's rapid expansion of renewable energy facilities has since caught headlines around the world. According to the International Energy Agency (IEA), the country installed more than 34 gigawatts of solar capacity in 2016 - more than double the figure for the US and nearly half of the total added capacity worldwide that year. "It's a huge market," says Heymi Bahar at the IEA. 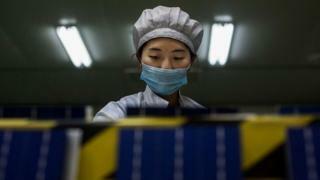 Most of the world's solar cells are made in China and Taiwan, he adds - more than 60%. The impressive scale doesn't stop there. The largest solar farm in the world - Longyangxia Dam Solar Park, all 30sq km of it - is a Chinese project. And the country recently opened the world's largest floating solar farm, in Huainan, Anhui Province. It has been constructed over an old coal mine, which over the years had filled with rainwater. Sungrow, the Chinese firm that designed the solar plant, says its system automatically monitors current and voltage generated by the cells, along with humidity, which can affect their efficiency. Because of the abundant water nearby, cleaning the panels - an endless task for solar farmers - will be easier, according to those behind the facility. "What we were all hoping for 20 years ago when the idea of cheap solar was just a dream, was that someone would come into this on an industrial scale and drive down the cost," recalls Charles Donovan, at Imperial College Business School. "That is exactly what China has done." But today, solar energy production accounts for just 1% of China's total energy demand. A huge 66% of demand still comes from coal, something that the country's National Energy Administration wants to change drastically by 2050 - not least because of China's well-known air pollution problems. But by that key date of 2050, a very different mix of energies could be powering China, should some projections become reality. One government report even suggested that renewables could supply 86% of the country's energy needs, with solar providing around a third of that. Can China do it? According to one expert observer, the answer is, "maybe". "What China is trying to do is rationalise a very large, fast growing system," explains Jeffrey Ball at Stanford University's Steyer-Taylor Center for Energy Policy and Finance. Ball is the lead author of a recent report that details China's success as an innovator in the solar panel industry. But as Ball points out, the revolution has not been without teething issues. For one thing, Chinese subsidies, which some argue are unsustainable, have not always been smoothly administered. The "feed-in tariff", for example, often offered to solar companies that generate electricity, has sometimes been paid late. "The government is often a year or more late in delivering that revenue - that wreaks havoc with the financials on a project," says Ball. The value of subsidies has recently been cut, too. What's more, China's large solar farms are largely in less densely populated areas in the west of the country, far from population centres like Beijing or Shanghai, in the east. Building extra grid capacity to transfer it is time-consuming and expensive. This leads to a problem known as curtailment - a solar farm produces, say, 20 megawatts of electricity but can only find buyers for 15 megawatts. "Depending on who you talk to in the provinces that have by far the largest amount of solar production, curtailment rates are 30% and in some cases significantly higher than 30% - that's extraordinary and that's a real problem," explains Ball. Whether China can achieve its lofty ambitions for renewable energy remains to be seen - but it has certainly proved its ability to foster a world-leading solar industry. For US entrepreneurs like Geof Moser, that's enough to propel his own business towards further growth for now. "The reality is that renewable energy is very cheap - especially solar energy," he says. "And the reason is China."